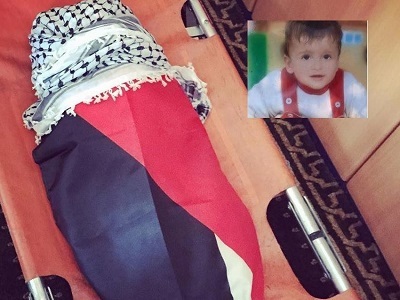 Under what heading can we put the burning of a Palestinian infant? Why are the Jewish settlers acting with such venomous fury against Palestinian citizens in recent years? In fact, the burning of Ali Saad Dawabshah aged 18 months near Nablus can’t be seen as an isolated crime committed by Jewish settlers in the occupied West Bank. This crime is only one of a series of crimes committed by settlers who are always protected by Israeli Occupation Forces. Jewish settlers know that all their deeds against Palestinians are never condemned or banned by the political leaders of their right wing Israeli governments during the last 15 years. Successive Israeli governments have in fact protected the Jewish terrorists, claiming in many cases that the perpetrators are either lunatics or mentally ill. In general, such brutal crimes are committed by right wing criminals, who have the conviction that the life of Palestinians are of less value than Jews, and that they are no more than animals, insects and rats. The continuous incitement by religious people and Jewish Rabbis also plays a strong role here, especially when we all know that such fanatics consider all non Jewish people as Goyim, and that God created all other mankind just to serve Jews. According to an Israeli analyst, the Jewish terror groups are no less than two hundred people, despite the fact that they are very much more according to Palestinian experts, but even if we want to consider the Israeli estimates, this number”200” can form a solid core of a terror army or group, not much different and not less dangerous than the ISIS terrorist group. In addition to that, no one can guarantee what will be the target and consequences of the supposed and planned acts that such a group may carry. It is true that the Israeli PM Netanyahu condemned the act, and considered it “an act of terrorism”, but when we know that about a hundred and twenty attacks have been carried out by Jewish terrorists in the occupied territories since the beginning of this year according to UN statistics, we realise that Netanyahu and his government are solely responsible for such crimes. The occupied territories according to international law, are the responsibility of the occupation government; this government is doing nothing to protect people under its responsibility, and in that case, must be held responsible for all the crimes committed in the occupied territories. This disastrous crime is a direct result of the impunity and protection given by the Israeli governments to Jewish terrorist groups. The neglect and indifference which the occupation government shows when crimes are committed against Palestinians is echoed in the impunity and hypocrisy of the international community in their failure to deal with Israeli crimes against Palestinians since this rogue state was established in 1948. When such terrorist groups see that their state is turning its back on the whole world, violating all international resolutions and laws, they will not hesitate to do more barbaric and disastrous crimes against Palestinian infants or adults. How can such terror be stopped? A question addressed to the Secretary General of the United Nations and all those who claim they are trying to maintain human rights and the elimination of terrorism in all its forms and sources.